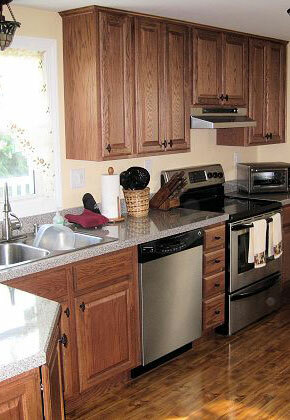 If you can only do one household project, that project should be updating your kitchen. The kitchen, as we all know, is an essential part of the home and London Handyman is your one-stop shop for your kitchen remodeling and repair requirements. Whether you are considering upgrading or re-facing your cabinets, replacing old countertops or upgrading your rubbish disposal, London Handyman can handle it all. All of our work is guaranteed from experienced craftsmen who walk you through the process every step of the way for a simple, smooth experience. Unlike other handymen who don’t offer project management, London Handyman is a full-service experience that will allow you peace of mind. We eliminate the hassle and make it easy by giving you a thorough overview of what to expect. You’ll know when the job is going to start, what time we will arrive and when the job will be finished. We always go the extra mile. Thank you for having exceeded all my expectations, your handyman Terry was able to make the weather strip fit even though I had bought the wrong size. Your help was invaluasble. I wanted to tell you what a terrific job your Handyman has done! He was promptly here at 8.30 every morning. He performed every task with perfection. He cleaned up meticulously, every night before he left. I couldn't ask for anything more! Many people I know have told me horror stories about the handymen they've hired to do some remodeling projects. This is the second time I have used London Handyman and I'm as pleased as I could be. Both my next door neighbour and my cousin have been here on several occasions "checking out" Terry's work and they have told me they would definitely use London Handyman on their future projects.